Select your favorite coffees to receive every month. Finally, it’s here. Pick your favorite coffees and we will send them to you automatically. No more time and energy spent ordering. 1. 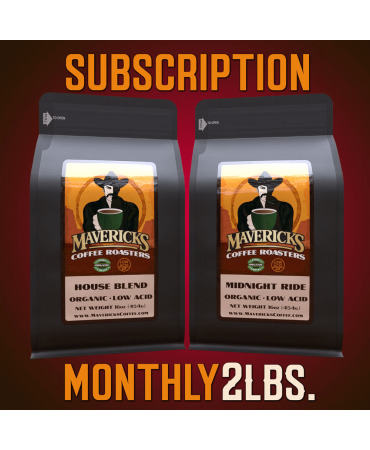 Select any two of your favorite 1 lb bags of low acid organic coffee. 2. Choose whole bean or ground. 3. Add to cart and check-out. We will send you coffee every month on the day you originally ordered. For example, if you ordered on March 7th, your next order would be sent to you the following month, on April 7th. Please allow for a day or so for shipping. It’s easy and you save money. Cancel when you want. Can I change my Coffees? Yes, just log into your account, choose subscriptions, and cancel your current subscription and start a fresh subscription with your new selections. Simple, easy, no pressure or commitments, or fees.